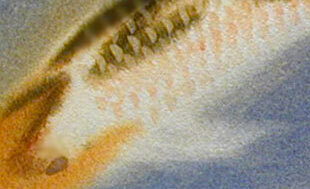 The first thing you are going to need a watercolor painting of fish to paint the scales on. For the purposes of this lesson, I will assume that you have it already. Its important to note that it is not important what the color or value of the fish are. 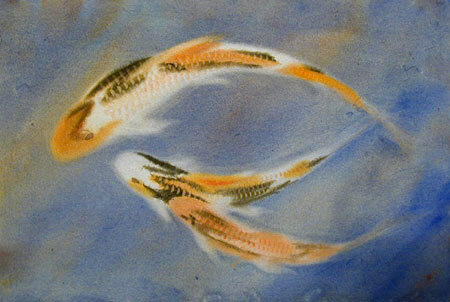 I create several fish in each painting, at least three, sometimes many. The fish might be all goldfish, in which case the color will be a rich warm yellow, ( slightly to the orange ). Mostly I like painting koi. They are a member of the carp family, can grow to meal size, and come in a range of colors, from white through pink , red, orange, brown and black. The whole color range is often found in a single fish. As you will see, we can handle the whole fish at once; a variety of colored subjects is not a problem at all. You will also need to download a full size copy of my template. You will find a button and instructions at the bottom of the page. 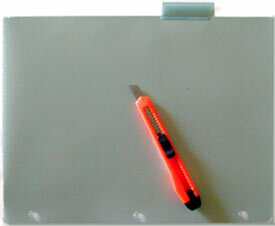 Tape a copy of the template to the plastic sheet so that you have the cutout area centered on the plastic. Then (of course on a cutting surface) cut the stencil. It will take a lot less time then you might think. Take a small soft DAMP sponge. A wet sponge will get water under the stencil and make a mess. Position your stencil on the fish. Start just behind where the gills would be, using the largest stencil opening you choose. If you want scales on a dark area of a fish, just rub the painting through the stencil with your damp sponge. It will lift a little color, and make very clear scales. If you want scales on a light area of a fish, then you need to add some color. Select the color you want to make the scales and put a little on the sponge. Just rub the painting through the stencil. It will add a little color, and make very clear scales. The part of the stencil you will be using is the three "strings of graduated pearls. ( I cut the other openings into my stencil, but have never used them. I recommend you omit them in your first stencil ). You also must choose the largest scale in the row you want to use, this will usually be the first one). Position your stencil on the fish. Start just behind where the gills would be. Rub the damp sponge over the first few scales. You may need a few back and forth rubs. When you have those scales the way you like, slightly rotate the stencil around a point just after the last scale. You rotate the stencil to follow the curve of the fish body. Repeat the rub and rotate until you are done with the row. Extra rows are done by repositioning the stencil. That's all. And its a lot easier than it sounds. Before clicking the link please read this. Upon clicking, you will be taken to a pay-pal page where you will be asked to donate $2. to the site. This will cover some of the cost or running the site and bringing you these lessons. Upon completion of payment page, you will be taken to the template. Use your Print Screen Button. to make as many copies as you like. Note: This graphic (template) is copywrited by Larry Weiss. It is licensed for single user only. You may make any number of copies and or enlargements and reductions for your personal use. You are not authorized to distribute or share it in any way.